One of the most hyped beauty brands of the moment would definitely have to be Anastasia Beverley Hills. They're famous for eyebrows with their most talked about products being their 'Dip Brow Pomade' and 'Brow Wizz' eyebrow pencil. There probably isn't many beauty blogs or Youtube channels that haven't featured something from the brand and their social media channels are a huge source of beauty inspiration for many. 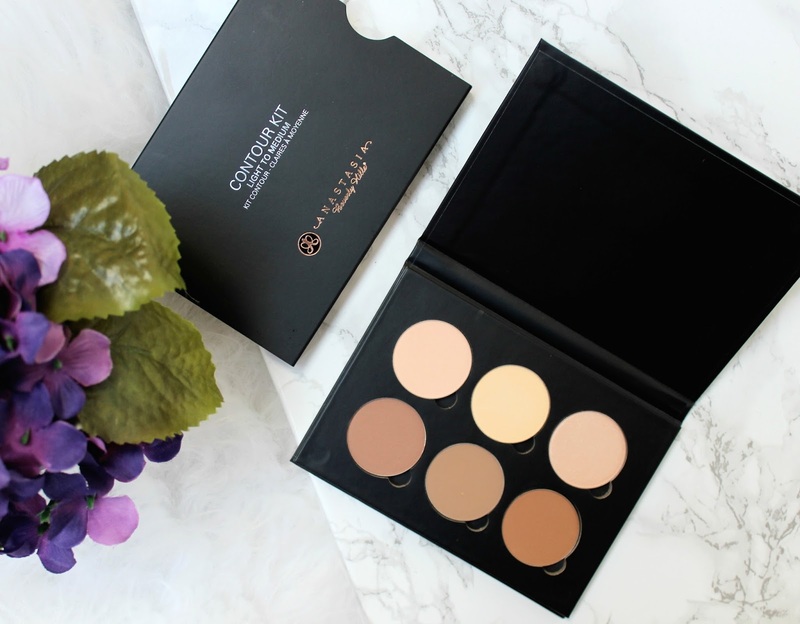 With this being said, I was very excited when my boyfriend recently brought me the contour palette, another one of Anastasia Bevelery Hills most famous products, back from his trip to America. I'm always interested in trying any products that can help to give my face more definition as I unfortunately wasn't blessed with naturally amazing cheekbones! 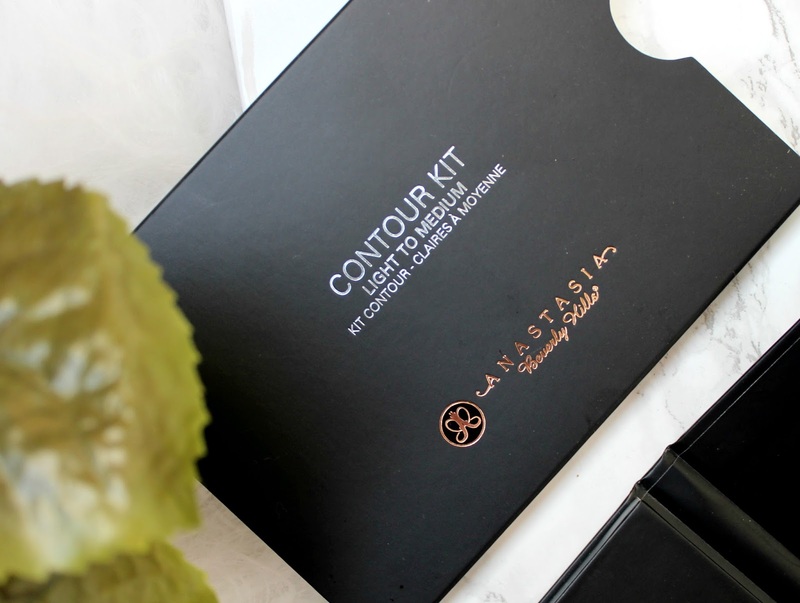 As I said, the contour kit is one of ABH's most hyped products so it was something I'd seen reviews of on other blogs and Youtube channels before receiving it myself. I always thought it looked great and the selection of colours in the 'Light to Medium' palette looked perfect for my skin tone so I was really excited to give it a try. I've been using it most days for the past couple of weeks now so I feel I can now review it fully and let you know whether I think its worthy of all the hype surrounding it! The first thing I have to mention is that the palette is cardboard and doesn't have a mirror which is quite surprising considering it isn't the cheapest palette in the world. I expected something a little more sturdier and expensive looking but I guess that's only a small complaint as the packaging fortunately doesn't affect the contents or the quality of the products inside. As I mentioned, I've got the Light to Medium palette but there is two darker shades available too. 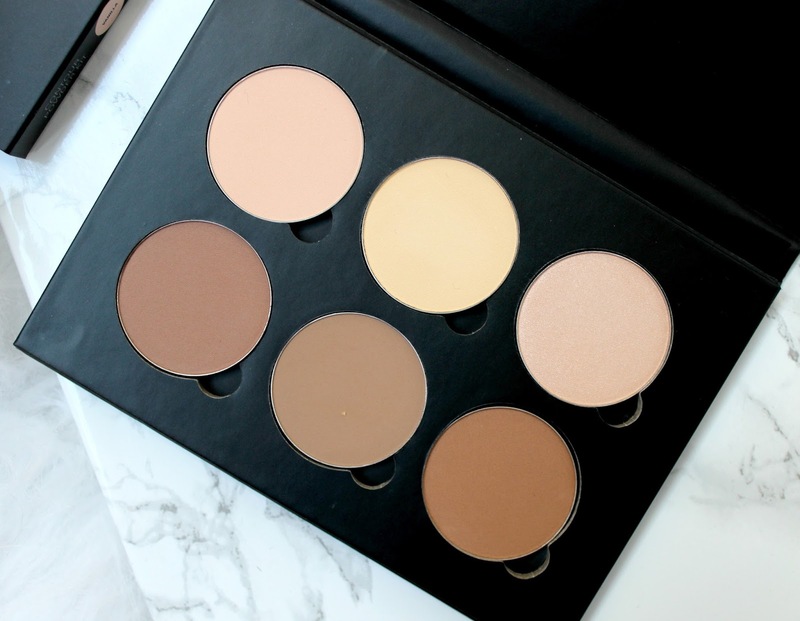 The palette contains six shades in total - three lighter shades to highlight with and three darker shades for the contouring and bronzing. My favourite shades would have to be the middle and right hand shades on the top row and the middle shade on the bottom row. I love using the yellow toned shade (middle of the top row) over my under eye concealer as it brightens as well as counteracting dark circles. I have the Ben Nye banana powder and this is similar but a lot easier to use as it's a pressed powder rather than loose. The shade on the right had side of the top row is the only shade of the six to have a slight shimmer in it, the rest are completely matte. I really like using this one for a subtle highlight on the tops of my cheekbones and down the centre of my nose. I'd probably use something a bit more shimmery for a night out but for a day to day look, it adds a lovely subtle glow. 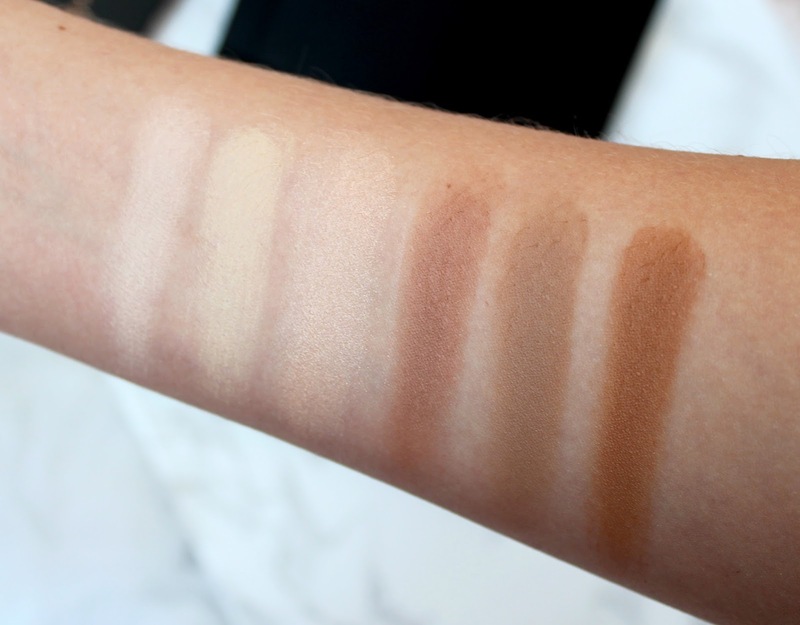 The contour shade in the middle of the bottom row is absolutely perfect for my skin tone. It's a mid-toned brown shade and because it has no Orange tones in it, it creates the illusion of a natural shadow which is perfect when creating those chiselled looking cheekbones. I also like to use it down the sides of my nose, around the sides of my face and along my jaw line. When blended, it provides a very natural looking contour. However, although the other shades are more Orange toned, I still like to use them to add some warmth to my skin and often use them as I would with a bronzer and dust them all over my face. The powders are really easy to blend too which is important when contouring as the last thing you want is any harsh and unnatural looking lines on your face. Overall, I'd say this is a really lovely product and one I'd highly recommend trying. If you can get your hands on one in America or get someone to grab one for you, you can get it for a really reasonable price (around £26 I believe) but if you order it online here, it will cost £39.00 which is quite a big difference but I do still think it's worth it as its something I'll get a lot of use out of and I imagine it will last a long time too. Is this a product you'd like to try?! This palette looks so beautiful, it's one that will definitely be featured on my wishlist! Ahhhh love this! I'm really tempted to get the cream contour palette - both look amazing. Anastacia or Too Faced contour palette? Which is better? I love Anastasia products a lot :) Their eyebrow kit is the best! I'm curious for this contour palette. I have heard a lot of good reviews about this product but have yet to try it for some reason. This would be great for travelling or everyday as it has everything you need in one place. I will be adding this to my Christmas list. The colors look great. Your boyfriend is one very thoughtful guy to have gifted that to you! This is my all time favorite contour palette!! I'm a contour addict, if I don't contour I don't feel like me! I think this is a product I need to get my hands on. That is the palette of dreams! Ive been using this pallet for a while now and absolutely love it!! This is such a cool palette and the shades are so dreamy. Hoping to get this as a present on Christmas. Banana and Fawn are my favourite shades in this palette, they're so good for fair skin!